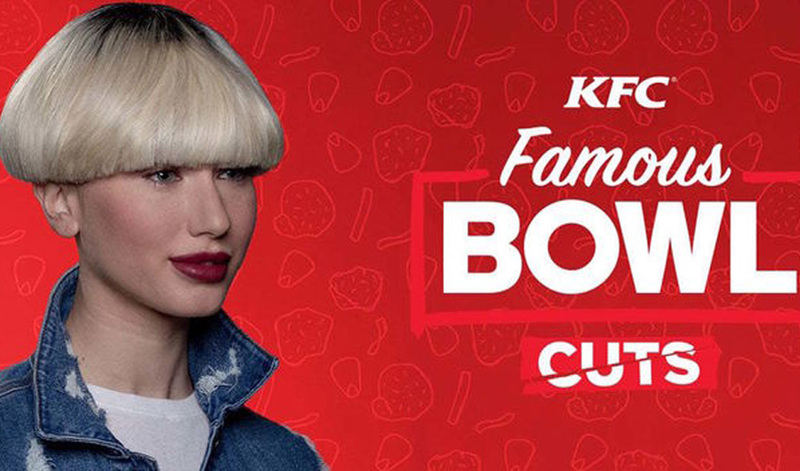 Past fashion trends, whether remembered with nostalgic fondness or hideous embarrassment, get people talking.Amongst shell jackets, combat trousers and Buffalo shoes, few made people cringe as much as the bowl cut and yet those crazy marketeers at KFC are bringing it back… Yikes! The brand that brought you the Colonel Cat Climber has continued down the path of the weird and wonderful with a positively hair-raising campaign to promote its Famous Bowls range and launch the new Spicy Bowl. KFC surprised and delighted consumers with a chance to revive their '90s style and win a trendy bowl cut at a unique and bold pop-up event in Brooklyn, New York. 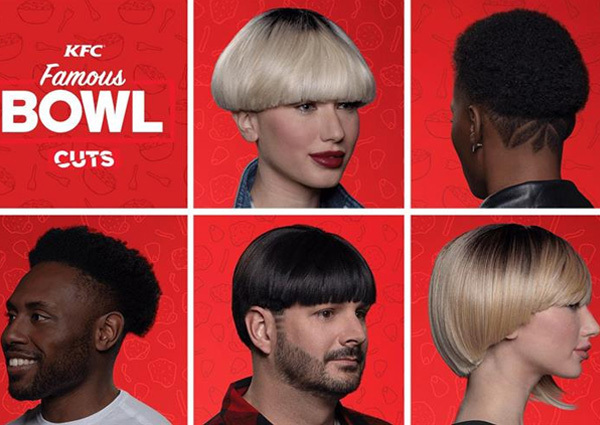 In true outlandish KFC style, the brand worked with actual hair stylists to produce five modern-day takes on the infamous bowl cut. For just one day, fans could book themselves into the salon for one of the retro styles; a real show of love for the brand. Participants were rewarded with a KFC gift card for a Famous Bowl and were also given the opportunity to have their photograph taken and star on the brand’s social media channels. Extending the campaign further, the celebration of '90s hair was not limited to those who lived locally to the pop-up stand. A digital lookbook was also created so committed customers could show their own hairdressers and get the looks wherever they were in the world. To strengthen the tenuous link between bowl cuts and chicken, KFC gave each style a KFC spin, with names such as The Gravy Fall, The Colonels Stripes, and of course The Classic – an option which came with a suggestion to ‘spice it up’ with a splash of red dye, a colour reminiscent of the sauce used in the Spicy Famous Bowl. The campaign was amplified on social media with the hashtag #KFCFamousBowlCuts which sparked many people to post a picture of themselves as children sporting the sweet yet embarrassing hairstyle. 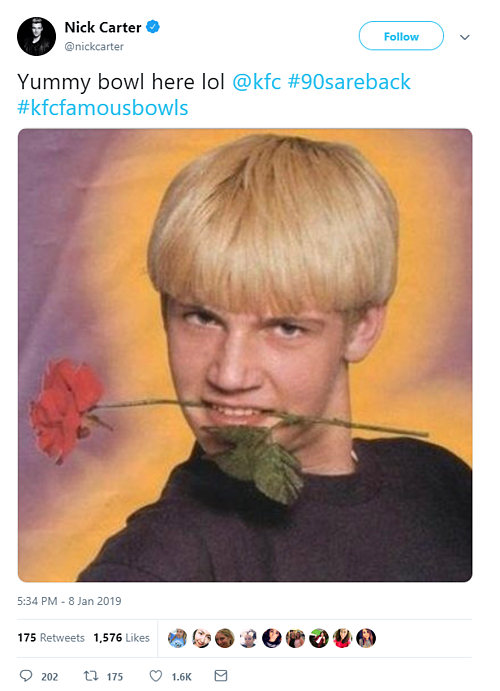 Even prominent Backstreet Boys member Nick Carter, who rocked an almighty bowl cut in the 90s, responded to the fast-food chain on Twitter, throwing back to an old picture of himself. The fun-filled and highly memorable experiential campaign grabbed consumer attention and effectively built brand love by tapping in to the trend of retro styles and bringing it to life. Capturing people’s love of nostalgia, we’ve seen a few brands reviving past decades in fun experiential campaigns to increase brand appeal; New Balance revived the '90s to celebrate the launch of a new trainer, and the creators of Bandersnatch went back even further, celebrating the '80s with a Bandersnatch pop-up shop.